A quick guide to survival the harsh conditions of the Dark Zone in the Division. 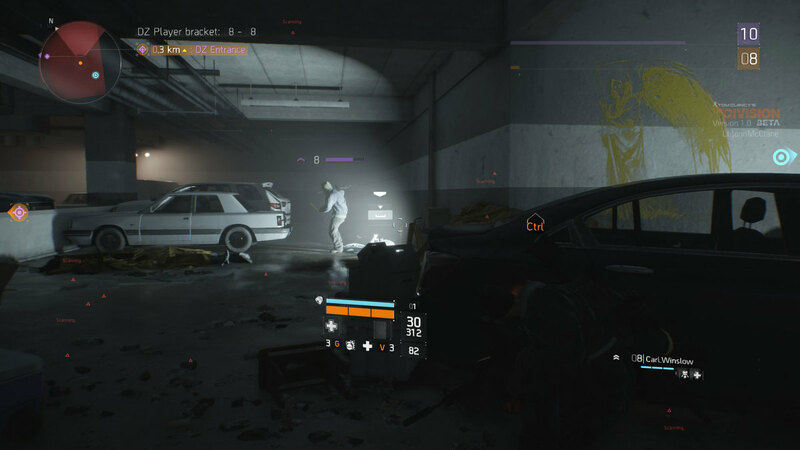 The Dark Zone is no place for the feint of heart, and surviving just a few minutes without getting taken out by the tough NPCS and other players will take all of your wits and a decent armory. If you can last you’re in for a treat, as the Dark Zone holds he best loot available in the game. But finding it is only half of the battle, you’ve got to get it out before you can even use it. All this can be overwhelming to the new player accustom to the relatively tame sections of the city outside of the Dark Zone, but luckily for you we’ve spent enough time in the dark to gather a selection of tips that should help you out. You can easily improve your chances of survival by adding more people to your squad. Officially you can have up to 3 other players in your group, but it’s not uncommon for multiple groups to team up to complete some of the tougher challenges. Just be wary of who you let into your group, as treachery abounds in the Dark Zone. The Dark Zone is a big place with lots of alleys and side streets where enemies can lay in wait to ambush you. When you’re in the Dark Zone keep your head on a swivel and if you’ll got the pulse ability, use it liberally to detect nearby enemies you can’t see. NPC’s also have a habit of spawning right on top of you at the worst times, so make note of where you are on the map. Landmark areas are popular NPC spots. The same goes with any supposed “allies” you meet and group with in the Dark Zone. In the blink of an eye a friend can become an enemy who runs away with your loot, so don’t ever get too comfortable unless you really know your squad mates. The yellow bag that appears on your back when you pick up a piece of loot in the Dark Zone might as well be a bullseye. When you’ve collected some loot (especially rares are better), make your way to an extraction point as fast as possible. That shiny new piece of gear isn’t truly yours until it’s been extracted back to base. The most vulnerable you’ll ever be in the Dark Zone is waiting for an extraction. If you’re solo, or in a small group, hide near the extraction point after calling in the helicopter and then swoop in quickly when it lands. Larger groups can try to control the point, keeping an eye on the entry points to the extraction zone. Attacking a non-rogue player is all it takes to attract the attention of everyone in the nearby Dark Zone. 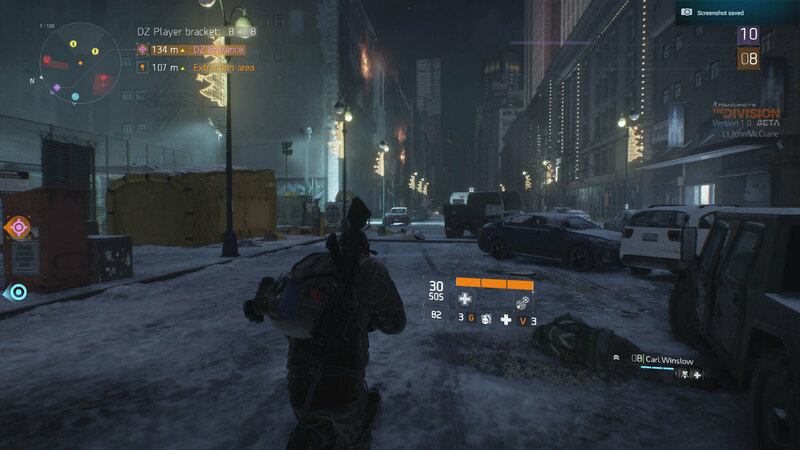 Players who have gone rogue are relentlessly hunted by other players in the Dark Zone because of the bonus loot that rogue players drop, and the fact that there’s a giant skull over their head letting you know exactly where they are at all times. If you feel the need to go rogue, expect to be swarmed by other players out for blood. That being said, if you can survive and escape the onslaught you will be rewarded with bonus Dark Zone currency and experience after your rogue timer expires, something to consider when making the decision. Safe rooms are great when you want to take a break from the action or restock on ammunition. You can find nearby safe rooms marked on your expanded map. There you can regroup with your squad safe from the mayhem of the dark zone and restock all of your ammunition and medpacks. There is also a dark zone vendor in each safe room who sells some pretty powerful gear. Be sure and check in often for his rotating stock. The Dark zone is divided up into sectors based on level. The different sectors are marked on your map, and by a transparent wall that will appear when you come close to the border. The sectors are marked with the level range required to safely take on the NPCs of the area, so be sure and stick to the areas round your level to avoid becoming fodder for an NPC, or high level player.